Maura Allaire was living in Michigan when the news broke: The people of Flint, a neighboring community, were being poisoned by their water. Allaire had spent years studying water resources management in Ghana and Thailand, and the story piqued her interest. She wondered: Is this happening in other cities in the Rust Belt? Allaire, a member of AAAS, applies the analytic tools of economics to the problems of managing water. “It really made me question, where is this happening in the U.S.?” she said. Much to her surprise, no one had ever checked. So, as a component of her postdoctoral research with Columbia University's Earth Sciences Institute, she decided to investigate. A glorious trove of data awaited. The Environmental Protection Agency keeps a nationwide database on water quality test results. No one had ever analyzed the data over decades to find out where health-based violations tended to occur. What happened in Flint, she found, was an anomaly. The findings brought a blitz of news coverage to Allaire, who is now an assistant professor of urban planning and public policy at the University of California, Irvine. EPA data from 1982 to 2015 showed that water companies in rural, low-income communities had the highest rates of failure in water quality tests — not systems in declining Rust Belt cities. During that period, between 9 million and 45 million Americans a year encountered conditions that could have caused their drinking water to make them sick. In 2015 alone, 38,000 violations of the Safe Drinking Water Act were health-related. The systems with violations that year supplied water to 15 million people. In most cases, the trouble could be traced to a combination of economic, governmental and climate conditions. In Oklahoma, all three problems recurred: Small water companies had more trouble raising loans and revenue to pay for upgrades to their systems. Hot summers have led to high organic content in source water. And the state mandates one of the highest levels of disinfectant, which, when combined with nitrates, can result in a cancer-causing byproduct. “As a state, year after year, it had the most trouble meeting national standards,” Allaire said. Throughout her career, Allaire has found that changes in government policies — and in governments — can help or hinder efforts to improve water quality. Allaire had gone to Ghana on a Fulbright Grant after graduating from Tufts University. When she started, she was focused as a hydrogeologist on how to better manage small reservoirs — measuring gains and losses of water. “I went in focusing so much on the natural science,” Allaire said. But living with a family in a rural village awakened a different sensibility. When she returned to the United States, she worked as a hydrologist consulting with private companies on cleanup of contaminated sites. She said it was “disheartening” to find that companies were more interested in checking off boxes on a list of basic requirements than in engaging in effective cleanup. In 2010, Allaire did research at the University of North Carolina at Chapel Hill. For her doctorate, she spent time in Bangkok. Over the course of two years, she studied the impact of the country's ongoing flooding on households. In short, she found that losses of income and property because of flooding disproportionately affected the poor. They are more likely to lose hourly wages and are less likely to be able to recover lost property. Allaire worked with disaster management officials in Thailand to determine the best methods of encouraging citizens to prepare for floods — such as telling them that a good percentage of their neighbors had bought flood insurance. But her work ended after the country's leadership changed in a military coup. In the next year, Allaire will be building on her research about water quality in America. 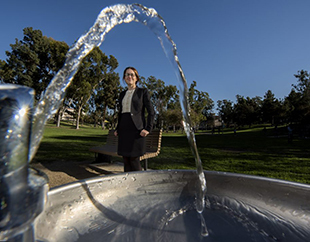 So she is developing ways to predict when violations of water quality standards may occur. As part of the model, she is tapping into marketing data of store-level sales of bottled water and anti-diarrheal medications by ZIP code. She's collecting these data for the last decade. Then she will look for matches in spikes of sales with reported water quality violations. The idea, Allaire said, is to figure out which communities should get priority for money for improvements in their water systems. Some water systems, she said, need support beyond the borders of small water districts. Policymakers in California, for example, are looking at consolidating water systems and establishing a “safe and affordable drinking water fund” to stabilize water systems in districts that can't afford upgrades.